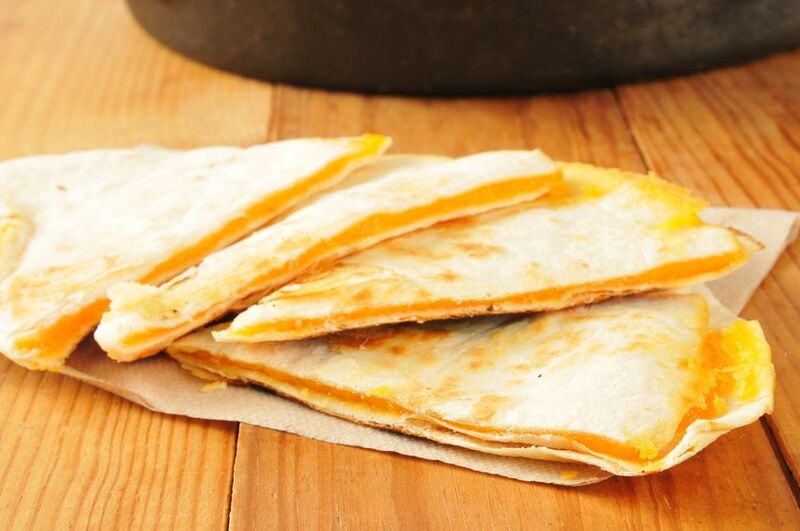 If you need a quick lunch to feed a hoard of hungry kids (or adults) during the holidays, these quesadillas fit the bill perfectly. They can be made in the kitchen in a fry pan but they are even better if they are done on the barbecue and the bonus is not heating up the house. You can add to the filling if you want to. Try sliced mushrooms or thinly sliced capsicum, add a little shaved ham or chicken - use your imagination to see what yummy combinations you can come up with. One more thing: you don't need to use tortillas. If they aren't on sale, use Mountain bread. It's cheaper and is ideal for these snacks. Of course making your own tortillas is always the best option; they are cheaper and so easy. If you haven't tried them yet, give them a go. The recipe is in the Bread Recipe File. Lay 4 tortillas into a large, non-stick fry pan and place over low heat. Spread 1/4 C of sauce evenly over each tortilla. Sprinkle each tortilla with cheese. Place a second tortilla over the top. Cook 5 minutes or until the bottom is lightly browned. Carefully flip the tortilla and cook an additional 3 minutes or until nicely browned. Remove and cut into triangles. Note: If your frypan isn't big enough to hold four tortillas do two at a time.